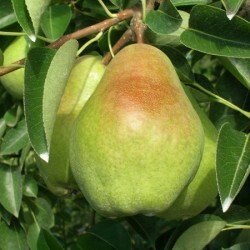 Pick pears before they are fully ripe because their flavor does not improve if left on the tree to ripen and they also start to drop when they are fully yellow. Harvest when they are turning from green to yellow. Grasp the stem between your thumb and forefinger and twist upwards. Do not pull down on the fruit. Leave the fruit at room temperature to ripen. Check out our Pinterest boards and our blog for pear recipes like pear crisp, crumble and cobbler, skillet pear cake and pear gorgonzola pizza.